(!) Due to the intrusion of the left rear door during the side impact test, the interior door panel struck the torso of the rear passenger dummy, causing a high lower spine acceleration. High lower spine accelerations, in excess of 82 g’s, indicate a higher likelihood of thoracic injury. A small-sized adult female crash test dummy is placed in the driver’s seat and is secured with a seat belt. The test vehicle, angled at 75 degrees, is then pulled sideways at 20 mph (32km/h) into a 25-cm diameter pole at the driver’s seating location. This test mimics a side impact crash involving a narrow, fixed object like a utility pole or tree. 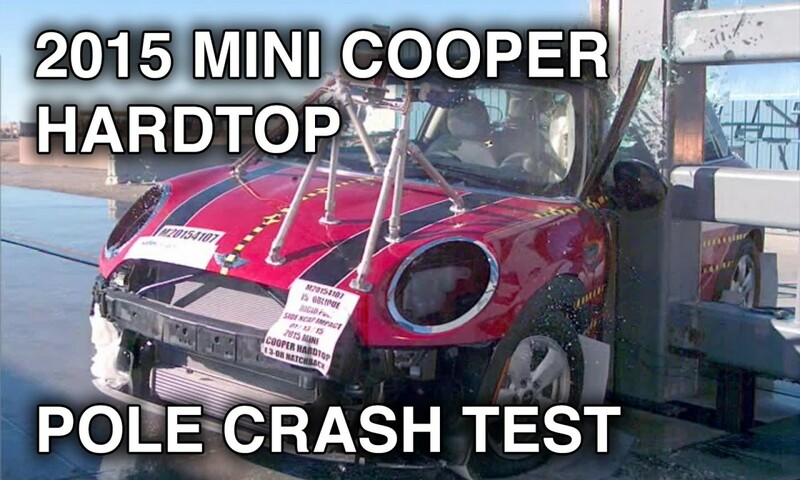 Posted On August 28, 2015 in Cooper, Mini with 0 Comments.Tagged: Cooper, Crash Test, Hardtop, Mini, MINI (Automobile Make).